The discovery of antibiotics greatly improved the quality of human life in the twentieth century. Antibiotics are drugs such as penicillin (pronounced pen-ih-SILL-in) and streptomycin (pronounced strep-toe-MY-sin) used to fight infections and infectious diseases caused by bacteria. Antibiotic drugs are made from living organisms such as fungi, molds, and certain soil bacteria that are harmful to disease-causing bacteria. Antibiotics can also be produced synthetically (artificially) or combined with natural substances to form semisynthetic antibiotics. These compounds work against strains of bacteria that are resistant to other antibiotics. Some microscopic bacteria that enter the human body through an opening or a wound find abundant food and reproduce quickly in great numbers, releasing toxins (poisons) as they grow or when they die. The toxins can destroy human cells or interfere with cell function, causing diseases like pneumonia or tuberculosis. Antibiotics fight bacteria either by killing them or by preventing them from multiplying. (Indeed, the word antibiotic comes from anti-, meaning "against," and bios, meaning "life.") It is believed that antibiotics accomplish these actions by damaging bacterial cell walls or by otherwise interfering with the function of the cells. Sulfa drugs. Sulfa drugs, originally developed for use in the dye industry, were the first effective drugs used to fight bacterial infection in humans. Prontosil, the first sulfa drug, was discovered in 1935 by German chemist Gerhard Domagk (1895–1964). Also called sulfonamides (pronounced sul-FOHN-uh-midze), these drugs are synthesized (made) in the laboratory from a crystalline compound called sulfanilamide (pronounced sul-fuh-NILL-uh-mide). They work by blocking the growth and multiplication of bacteria and were initially effective against a broad range of bacteria. However, many strains of bacteria have developed a resistance to sulfa drugs. Resistance occurs when some bacteria survive attack by the antibacterial drug and change in such a way that they are no longer affected by the drug's action. Sulfa drugs are most commonly used today in the treatment of urinary tract infections. The drugs are usually taken by mouth, but other forms include creams that can be applied to burn wounds to prevent infection and ointments and drops used for eye infections. Antibacterial: Working against bacteria either by destroying it or keeping it from multiplying. Antibiotic resistance: The ability of bacteria to resist the actions of antibiotic drugs. Soil bacteria: Bacteria found in the soil that destroy other bacteria. Development of penicillin as an antibiotic. In 1928, British bacteriologist Alexander Fleming (1881–1955) discovered the bacteria-killing property of penicillin. Fleming noticed that a mold that had accidentally fallen into a bacterial culture in his laboratory had killed the bacteria. 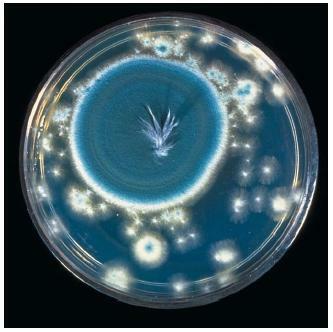 Having identified the mold as the fungus Penicillium notatum, Fleming made a juice with it that he named penicillin. After giving it to laboratory mice, he discovered it killed bacteria in the mice without harming healthy body cells. Although Fleming had made an incredible discovery, he was unable to produce penicillin in a form useful to doctors. It was not until 1941 that two English scientists, Howard Florey (1898–1968) and Ernst Chain (1906–1979), developed a form of penicillin that could be used to fight bacterial infections in humans. By 1945, penicillin was available for widespread use and was hailed as the new wonder drug. The antibiotic works by blocking the formation of the bacterial cell wall, thus killing the bacteria. It is still used successfully in the treatment of many bacterial diseases, including strep throat, syphilis (a sexually transmitted disease) and pneumonia. Fleming, Florey, and Chain shared the 1945 Nobel Prize for medicine for their work on penicillin. tuberculosis and was used in the treatment of many other bacterial infections. However, streptomycin caused harmful side effects, including hearing loss and vision problems that could lead to blindness. The discovery of streptomycin led to the development of a new class of drugs called aminoglycosides (pronounced uh-MEE-noh-GLY-kuhzides) that include neomycin (pronounced ne-oh-MY-sin), kanamycin (pronounced kan-uh-MY-sin), and gentamicin (pronounced jen-tuh-MY-sin). These antibiotics work against bacteria that are resistant to penicillin, but they tend to have many of the same side effects as streptomycin and are used only for a short time in cases of serious infection. Following World War II (1939–45), drug companies in the United States conducted worldwide searches to find molds and soil bacteria that could be synthesized (made in a lab) into antibiotics. Aureomycin (pronounced aw-ree-oh-MY-sin), the first of the class of antibiotics known as tetracyclines (pronounced teh-truh-SY-kleenz), was discovered in 1945. Another group, the cephalosporins (pronounced seff-uh-low-SPOR-inz), came from a bacteria group living in a drainage pipe on the Italian coast. The antibiotics in this group have effects similar to those of penicillin. Erythromycin (pronounced uh-ree-throw-MY-sin), made from soil bacteria found in the Philippines, is used in patients allergic to penicillin as well as to fight penicillin-resistant bacteria. Bacitracin (pronounced bass-uh-TRAY-sin), an antibiotic made from bacteria, was developed in 1945 and is used as an ointment that is applied directly to the skin. Resistance of bacteria to the effects of antibiotics has become a major problem in the treatment of disease. Bacteria that are not killed or stopped by antibacterial drugs may change in form so that they resist attack against their cell walls—or even produce enzymes that kill the antibiotics. Prescribing antibiotic drugs when they are not needed, not taking the drugs as prescribed, and using the drugs for long periods of time all contribute to the development of resistant strains of bacteria. The use of antibiotics in animal feed to promote animal growth has also led to the development of hardier strains of antibiotic-resistant bacteria. Since the first use of antibiotics in the 1940s, most known bacterial diseases have built up a resistance to one or more antibiotics. Measures to control the spread of antibiotic-resistant diseases include prescribing the drugs only when necessary, prescribing the correct antibiotic for the disease being treated, and making sure the patient understands the importance of taking all of the prescribed medication. Research in newer types and combinations of drugs is ongoing, as is research in the development of vaccines to prevent bacterial infections. Are the "sulfa drugs" considered to be anti-biotics or is penicillin considered the first antibiotic drug? I am doing a research paper about if sulfa-drugs the first antibiotic or penicillin. I could use any resources you have alvailable. i want to konw antibacterial synthetic dyes are toxic, why these dyes use for human cloth? The way I am understanding is your akinsg why does our body become immune to some antibiotics, and thus making them stop working. My sons doctor told me it was because if you keep using the same antibiotic over and over again, that the bacteria, can start to resist it because it is used to it being present in the body. For example my 16 month ol son has MRSA, I work in a drug facility, so I am around the jailed population alot, and I guess I brought it home with me, since he is so young he often gets outbreaks, and they need to be treated with IV antibiotics, but the prolem with MRSA is that there are only 3 or 4 antibiotics that work on it, Clindamycin, vancomycin, those are the 2 they usually give my son. I would say he has had about 6 outbreaks since he was 6 months old, and its been very hard because at any time those medications can stop working, thats why his doctor tries alternating the two hoping that his body does not become immune to one of them, because then we woudl run out of options very quickly. I hope this was helpful. this site really did help me with my project. I will use this again sometimes. 1.In your opinion synthetic or natural antibiotics are better? 2.How do natural antibiotics function while destroying bacteria in our body? I want to know why streptomysin cause blindness loss of hearing etc.